Lawyer Brett Morgan has big goals, including becoming mayor of Rocky Ridge and eventually, territorial governor. The only problem â€“ the town council wants the mayor to be a married man, and Brett has no intention of marrying a woman he doesnâ€™t love even if she is a â€˜suitableâ€™ politicianâ€™s wife. Lucy Hart â€“ with her dusty trousers, flannel shirts and callused hands â€“ plans to work the Two Harts Mine until the day she dies. She has no real education and no other way to earn a living, and she canâ€™t imagine any man being attracted to her. When Lucyâ€™s future is threatened by two men who claim her father sold the mine to them before he died, she hires Brett to help her prove the deed they have is a forgery. Even though Brett and Lucy are opposites in almost every way, their attraction to each other is undeniable. Can they prove the mine legally belongs to Lucy? And will Lucy and Brett deny their mutual attraction, or can they find a common ground and follow their dreams together? Brett Morgan leaned back in the chair behind his desk in Rocky Ridgeâ€™s only law office. His gaze drifted to the sheet of paper in his hand, then lifted toward the window looking out onto the main street. Through the dusty glass, a few puffy clouds dotted a cobalt blue sky. Wagons rolled by, raising clouds of dust. Muffled voices and the sound of footsteps on the sidewalk filtered through the walls of his office as shoppers hurried past. Childrenâ€™s laughter reached his ears. He smiled. The noise and activity outside meant the town was growing. And that meant a future for him. The election of a new town mayor was coming up, and heâ€™d decided a few days ago he was interested in the job. All he had to do was sign the piece of paper in his hand. So why was he hesitating? He knew he had the support of some of the more influential residents in town, but others were more reluctant. Their main issue was the fact he wasnâ€™t married. They wanted a mayor who they considered â€˜stableâ€™, a family man. He understood that, but he wasnâ€™t about to marry a woman he didnâ€™t love just to make the town council happy. Hell, heâ€™d only met two or three women lately who were educated and refined enough to handle being a politicianâ€™s wife, and not one of them had held his interest for longer than a few days. At that moment, the oak door burst open, the glass rattling. Startled, Brettâ€™s eyes widened and he straightened in his chair. A boy appeared in the entrance, silhouetted in a shaft of sunlight streaming through the open door. Dust motes hung in the air. A well-worn hat sat low on his head, keeping his face in shadow. He didnâ€™t speak, and as Brett watched, he patted the pocket of his red flannel shirt. Then, apparently not finding what he was looking for, he dug his hand into the pocket of his dusty brown trousers. The voice shocked Brett. Heâ€™d assumed from the clothes that his visitor was male. But instead of a deep baritone or bass, the voice was soft and breathy, with a hint of huskiness. Definitely not a manâ€™s voice. The woman closed the door behind her and crossed to the desk. She stood tall, her chin held high, her gaze steady. She looked up at Brett, and for a moment, he forgot where he was, who he was, everything. She was little more than a girl, he mused, a girl with sun-tinged skin and lips. A few freckles dotted a small upturned nose. But it was her eyes that drew him in. Heâ€™d never seen such eyes, the grayish-blue color of the river on a summerâ€™s day. They were ringed by long dark eyelashes. An immediate, undeniable attraction to this girl-woman slammed into him. Hell, what was wrong with him? He was lusting after a girl barely old enough to notice men. She had to be at least ten years younger than he was. She didnâ€™t speak for a few moments, and he couldnâ€™t help wondering if sheâ€™d also felt the connection between them. Finally, she slid a dirty and crumpled piece of paper across the desk toward him. Carefully, he unfolded the paper. â€œThis says the Two Harts Mine belongs to my pa,â€ she said. Brett skimmed the words. By all appearances, it was a legal document. He glanced up at her. His brows lifted. He wasnâ€™t sure what she expected him to do with this information. Brettâ€™s brows lifted. Twelve years? Hell, she didnâ€™t even look a day over sixteen. He nodded. â€œYou still havenâ€™t told me yours,â€ he pointed out. A faint pinkish tinge colored her cheeks. â€œOh â€¦ Lucy. Lucy Hart. You can call me Lucy.â€ She gave him a faint half-hearted smile. She sucked in a breath, and for the first time he noticed curves beneath the loose shirt she wore, curves heâ€™d missed at first. But for reasons of her own, she kept her femininity hidden. â€œPa passed on six weeks back,â€ she said, her voice breaking. Her eyes glistened, and for a moment, she didnâ€™t speak. â€œIâ€™m sorry,â€ he said. She was obviously still grieving, so he waited patiently until she could continue. 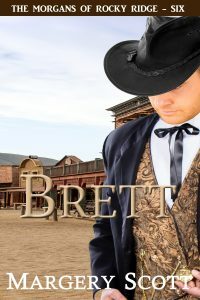 She planted her hands on her hips, and Brett couldnâ€™t prevent his gaze from following the movement, noticing for the first time how tiny her waist was. He was sure he could span it with his hands and still have room left over. Buy now on Amazon! Free on Kindle Unlimited!